I guess the great thing about my absence on this blog over the holidays, is that I have LOTS to share. I've been working on this quilt for a while. I started it because my blue scraps were plentiful...still are. I sewed it together in strips, I'd sew about 12 inches of strips together, and then square them up, to make blocks. 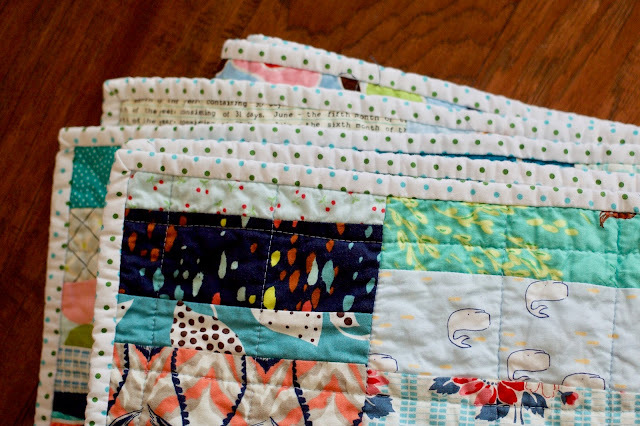 Once I had enough blocks, I'd sew them together to form a row. After sewing one or two rows, I decided to add in a few pops of orange. I like how it worked out. 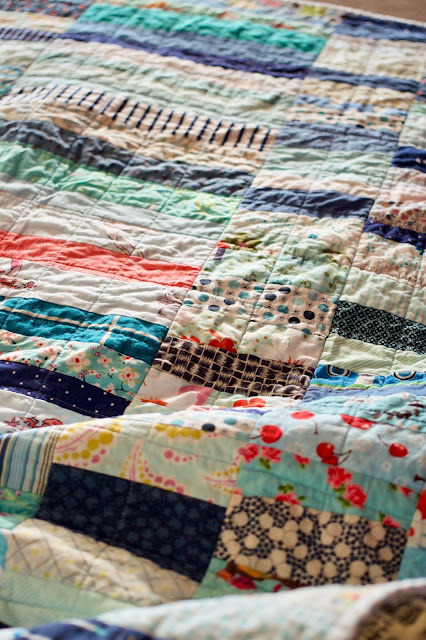 I love the scrappiness of this quilt. This is my backing...if I could change one thing about this quilt, it'd be the backing. I like the scrappy squares (good use of fat quarters), but I wish I'd used a different color--NOT blue. With so much blue on the front, I think a different color (yellow or orange, or even just low volume prints) would have worked better. I'm still happy I used up stash. For the binding I used this white polka dot (see here's another light binding). For quilting I sewed vertical and horizontal lines, randomly spaced (2-4 inches apart), and it's a winner. The quilt is still soft, it blends into this quilt design, and it was super easy! . 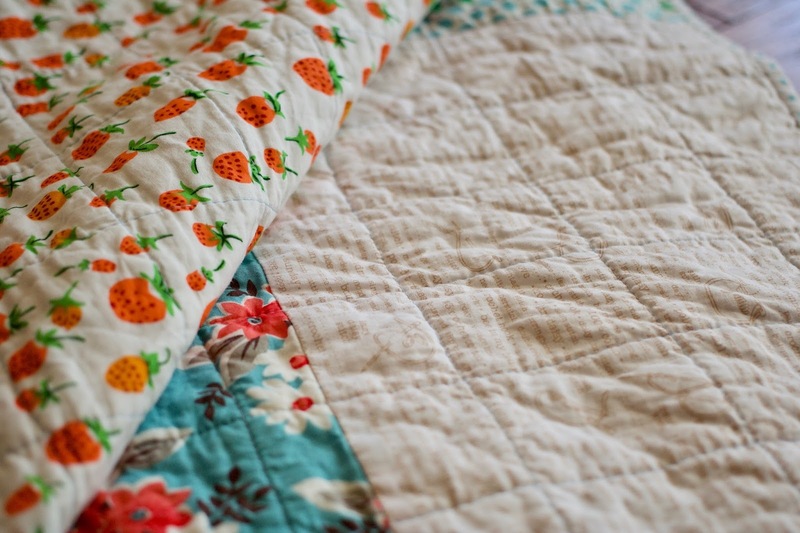 I was not excited about this quilt for quite a while, I didn't love much about it, but it's funny how once it's quilted and washed, how that can change. It's one of my favorite quilts right now. I like this ALOT! Thanks for the idea! 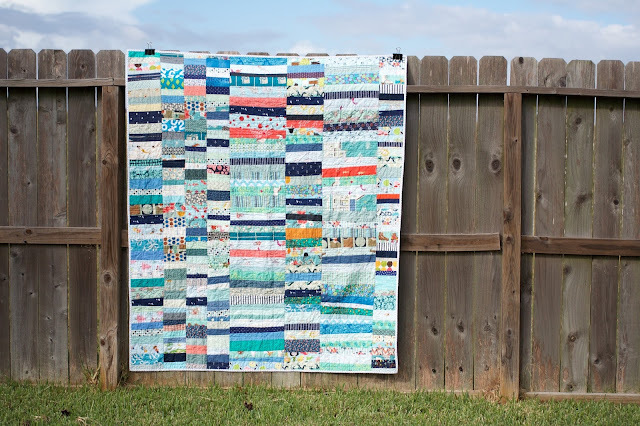 It's a gorgeous scrap quilt. I love the orange! What a great use of scraps and stash. Love the pop that the orange gives amongst the blue. 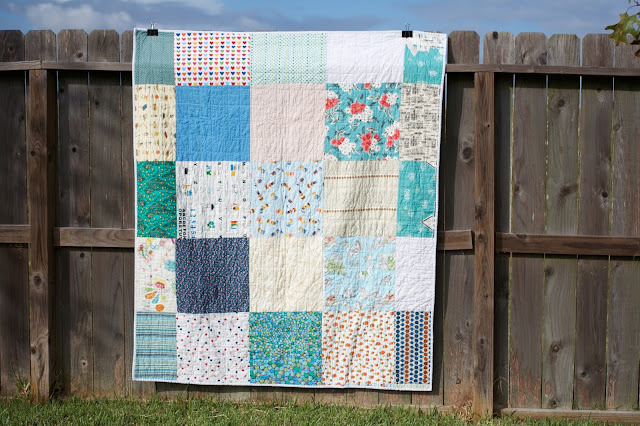 Oh it's such a sweet quilt! Scrappy in a slightly controlled way - very cool and the pops of color are important - not just the orange but the bits of color within the blue prints. I super like this!! 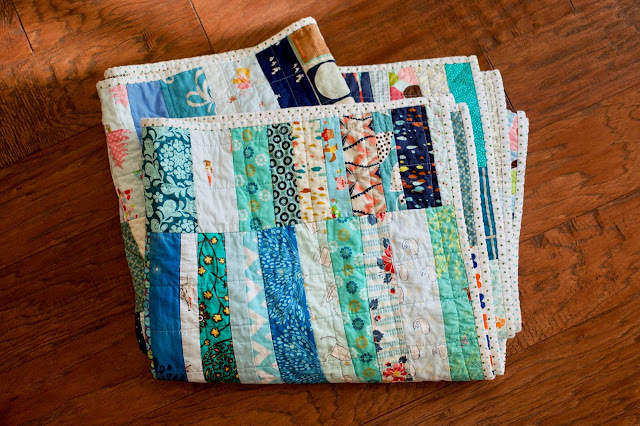 Makes me want to run for my scrap drawers and make one in every color! it's so soft and warm!! !